Do scientists begin to reflect the behavioral traits of the animals they study? It’s an analogy that’s been made about bear and wolf researchers. 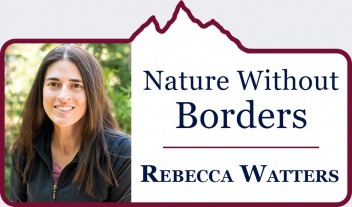 Rebecca Watters is executive director of two different organizations, one based in Bozeman and the other in Mongolia, devoted to rescuing the wolverine, the largest and imperiled member of the weasel family. In the Lower 48, biologists have speculated that only a few hundred remain. Calling wolverines "an Ice Age mammal," Watters often reflects on the symbolism of wolverines which, like wolves, doesn't always match their reputation. Thinking across map lines and cultural affinities is something Watters does well no matter where she’s working and Mountain Journal is pleased to add her to its stable of regular columnists. MOUNTAIN JOURNAL: You're at the forefront of a new younger wave of field scientists advancing the knowledge of wildlife in this ecosystem. Who are some of the people who have most influenced you over the years and why? REBECCA WATTERS: My parents, who are both historians, grounded me early in the idea that science always exists in a social and cultural context, so they’ve been a major influence on how I see my work. My grad school adviser, Dr. Susan Clark, was instrumental in helping me understand the specific complexities of wildlife conservation in the GYE. And I've had an ongoing affiliation with the Northern Rockies Conservation Cooperative. Wolverine biologists Jason Wilmot, Jeff Copeland, and Kim Heinemeyer have all mentored me in various ways on wolverine-specific research techniques. The Bozeman conservation community is incredibly generous and full of fantastic people, too many to mention here, but I love living and working here. MOJO: Why study wolverines in Greater Yellowstone and Mongolia? There aren’t many and they are elusive. WATTERS: The region of Mongolia where I work has a lot in common with Greater Yellowstone – similar landscape, a similar suite of species, several large national parks, a lot of livestock herding, and an indigenous culture with a strong environmental ethic. Mongolians are highly educated, and even though many of them still pursue a traditional nomadic pastoralist lifestyle, the spirit of the country is cosmopolitan, open-minded, and wildly modern. So it’s a good place to work, but importantly, it’s also a good place to be a student of a different worldview, where human-nature relationships are seen very differently. MOJO: As executive director of The Wolverine Foundation, what do you believe is the prognosis for Gulo gulo? WATTERS: Wolverines in the US Rockies and wolverines in Mongolia both live in meta-populations, scattered in widely-separated mountain ranges. But different land-use patterns, different management regimes, and different historical trends. We extirpated all of our wolverines in the early 1900s; Mongolia wisely didn’t. It means that we can potentially gain some insights into what works for wolverines – especially in the face of climate change. So I use wolverines as a focal point for working with the Mongolian national parks to build capacity for wildlife management, which is something they’re eager to gain. I also do some work on other species, and take scientists from the GYE over to Mongolia. And I listen very carefully to what my Mongolian colleagues tell me about how to coexist with wildlife, because they’ve done that successfully for millennia and we European-Americans managed to wipe out most of our country’s wildlife in the space of two centuries. It’s a mutual exchange. I have a lot to learn. MOJO: During your formative years after college, you became involved with a number of refugee relief efforts. How did that happen, where were you working and describe the conditions. WATTERS: In high school, I had a good friend who was Tibetan. During college, I was able to work with her family in India as part of my undergraduate anthropology work, which was about the role that Tibetan Buddhist nuns played in protest movements against the Chinese inside Tibet. Many of these nuns were imprisoned for years, and crossed the Himalayas to the Tibetan refugee communities in India once they were released, so that they could continue to practice their religion. The Tibetan refugee communities in India are very settled and stable, but the nuns’ role within them was, at that time, very unsettled, because they were arriving in large numbers for the first time. What started as a very theoretical project about the role of religion in political ritual turned into a human rights project as I began to document the experiences – which included torture – of these women. It was my first encounter with the negotiations that one makes, in the academic world, between the pursuit of pure knowledge, and the ethical obligation to engage and use your voice for change. MOJO: You also spent time in Bosnia. WATTERS: After graduation, on the basis of my undergraduate work, I was invited to run an art therapy program for Kosovar children in a refugee camp outside of Sarajevo in Bosnia. This was a very different situation. American jets were flying overhead to bomb Serbia every day. Bosnia was still full of landmines. In most areas you couldn’t step off of paved ground without risk, and there were shattered buildings and mortar holes in the pavement all over the city. Mass graves from the Bosnian conflict were being discovered and exhumed on a regular basis. The refugees were living in tents in an improvised situation where sanitation, food, and shelter were all uncertain. The children I worked with had been through horrific things, which they drew for me. We also played a lot of soccer. Some of them didn’t want to draw or play; they’d just crawl into my lap, pull my arms around them, and sit there shaking. I was living with a Bosnian family and they were still processing their own horrible experiences and losses. It was a short, sharp course in the depths of human depravity and the force and also the failures of human resilience after trauma. MOJO: Before focusing on wolverines, you were involved with wolf research. What insights did you glean about the animals themselves and the diverse human opinions about them? WATTERS: Wolves are biologically adapted to be successful. They’ll manage themselves. It’s the people who are the challenge. Most of the debate around wolves has nothing to do with wolves as a physical or ecological entity, and everything to do with interest groups vying for control over money, resources, influence, and the narrative of what the West is about. And the rhetoric at its most heated is not that far removed from the stuff you hear in ethnic conflict situations. In the end, I prefer hanging out with the Yellowstone biologists, who are still able to preserve a sense of fascination with the knowledge that we’re gaining. I’m most comfortable in those knowledge-driven situations. But there’s a much broader context that can’t be ignored. MOJO: When you explain to your friends that you're working in Greater Yellowstone, what is it typically that gets lost in translation and what is it that you want your contemporaries to realize about this region? WATTERS: The GYE is so frequently framed in terms of the relatively short history between European arrival and the present. We look back at William Clark’s first glimpses of this region and then different interest groups tend to advocate for how far we can stray from that baseline before we lose some ideal of the “real” West. We argue about whether authenticity is encapsulated in the moment of first contact, or whether it resides in the cowboy-and-logger frontier era. We need to have a much longer view, we need to be looking into our possible futures and having an honest discussion about where we want this region to be in a century, because things are changing and we aren’t going to be able to hold on to either of those myths. Humans have a difficult time engaging in visioning for the future - we tend to default to projecting our preferred pasts forward, but we need to quit doing that and be more proactive about what we want to see happen. Also, on a purely romantic level, the GYE is the beating wild heart of the northern Rockies and the inspiration that it provides is incalculable. It’s hard to convey that to people who haven’t experienced it. MOJO: In some of your columns you will be probing the question of whether it's right or wrong for scientists to become advocates of the species they study. Can you give us a sneak preview of some of the important issues you believe figure at the heart of conservation biology? These are big, systemic problems. And more specifically for conservation biology, dealing with climate change, looking frankly at the limitations of our current tools (legal, social, cultural, scientific) to deal with this overwhelming challenge, and developing ways to communicate effectively with the public are key. Do scientists have to become advocates? Maybe not. But we need to stop fixating solely on computer models that generate connectivity maps and occupancy measures, because while this stuff is great for advancing knowledge, it still leaves us adrift on how to actually reach conservation outcomes, let alone deal with the faults in how we talk to each other, develop policy, and so on. Marshall Cutchin Brings Modern Thinking To Heraclitus' "Same River Twice"